Digital Equipment Corporation PDP-7/A - S#103? 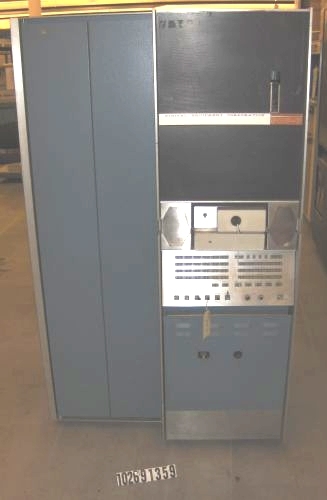 Emails from the Computer History Museum have confirmed they have a PDP-7 in storage, having originally been at Massachusetts General Hospital, it is one of two delivered to the hospital in 1965-66. The machine in photo (right), we think is probably S#33, however CHM have checked their machine in storage but a matching serial number has not been found, so it is now unlikely that we will find out which of S#33 or S#103 the photo actually is. Either way the machine in the picture does not appear to be complete as it is missing its tape drives. December 2009 - Len Shustek at CHM has forwarded a few more photos of their PDP-7 in storage; unfortunately they don't go any further in ascertaining the identity of the Massachusetts General Hospital machine other than to confirm it came from their Psych. Res. Laboratory. Serial numbers still need to be found, the only evident serial number on the core memory stack photo does not match the service list for either of the two machines. The physical condition of the machine is very good if not somewhat dusty, with the front panel operator controls having suffered from the usual damage that PDP-7's seem to get - broken and bent switch levers. S#103 was a PDP-7/A, and had options - 138E, 139E, 149B, 177B, 550A, KA71A, KA77A, 2x TU55. S#33 a PDP-7 had options - 7, 30D, 75D, 138E, 139D, 149D, 177, 444B, 555A, 649, PDP7. Attached is a portion of an article forwarded by David as being found on Wikipedia (https://en.wikipedia.org/wiki/MUMPS), it was subsequently found in - Google Groups on this link. "A History of Medical Informatics", Bruce I. Blum and Karen Duncan, ACM Press History Series, Addison-Wesley, 1990, ISBN 0-201-50128-7"G. Octo Barnett, MD, "History of the Development of Medical Information Systems at the Laboratory of Computer Science at Massachusetts General Hospital". "In about 1965-66, Neil [Papparlardo] and Kurt [Marble] tried [unsuccessfully] to persuade me that we could develop a programming system... Neil ignored my guidance, as was his usual habit, and proceeded with the development of MUMPS... To this day I have not been able to trace who thought of that name, or why we did not come up with a more dignified title." "Early hardware: The first implementations were on a PDP-7 with 8K of memory (18-bit words with three teletypes and a 256K fixed-head disk. The complete MUMPS interpreter with input/output routines and buffers occupied 4K with active user programs residing in one of the 2K partitions." "A major breakthrough occurred when we obtained our first PDP-9 computer which utilized a 24K memory. The initial MUMPS systems were constructed before we had developed the global file-handling system... One of our first ambulatory medial record systems had an active database stored on over 100 different DECtapes [these were tiny reels of 3/4in tape, storing about as much as a modern floppy, but with about 30 second seek time--DPBS]"
Note - the "me" above is not David Moccia. David continues - When I was hired by Digital in 1967 the PDP-7 was the current 18 bit processor being supplied by DEC. The PDP-9 was in development and soon to be released. At that time Field Service techs, my self included attended PDP-4 and PDP-7 training classes, in the 18 bit world. There were 12 or so PDP-7’s under field service contract in the Boston/Cambridge area. Among the others were two at BBN (Bolt Beranek and Newman) #148 and #150 as front ends to the TELCOMP timeshare systems. Two identical systems at MIT Lincoln Labs (S#24 S#30?) were relocated from Billings Montana for seismic studies, and were very large systems with a custom interface that allowed them to share six Midwestern magtape drives, a card reader, and an Analex 132 column line printer." I hope I have shed light on the systems you have in your domain. Very interesting work you have done and continue to do. Dave."